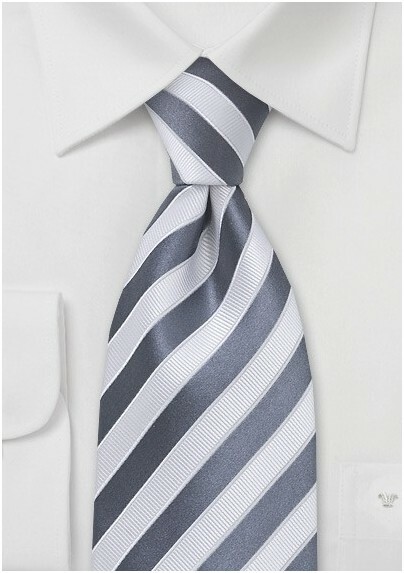 This smoke-gray and white tie will add a trendy yet formal and classy look to any suit in the gray to black range. The ribbed white stripes are contrasted with a smooth and shiny smoke-gray stripe. This tie is perfect for any season and suits your office attire as much as your next semi-formal function. This tie is easy to match making it almost too difficult to decide on a favorite outfit. 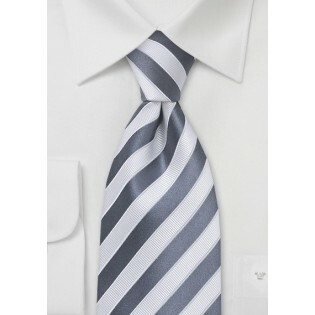 Nevertheless, we at Mens-Ties.com chose to pair this tie with a charcoal suit and plain white shirt. Handmade from silk by Cavallieri.